There are lots of code katas out there that are typically used to help developers practice test driven development and writing well-designed code. I have a new kind of kata for you today. In my last post I talked about how developers should be able to test their own code, but as developers we need to get better and defining all of the test cases. The only way to get better is to practice. Let’s say you need to test a basic four function calculator like this one. What are all of the testing scenarios? Keep in mind that just from looking at the picture, you might not know the exact requirements of how the calculator works without asking some questions. If you don’t know how something should work, write down the question that you need to ask or record the assumption that you made about how it should work (so that you could validate the assumption later). You’re also allowed to try things on your computer’s calculator to see how something should work (in real life, we often look at other implementations of our software to get ideas about how it should work), but remember to write down your assumptions so that you can validate them. Come up with your test cases, questions, and assumptions and post your answers in the comments. You can use any format for the test cases that you would like. Let’s see what you can come up with. How much of the responsibility for the software that you are creating falls on your shoulders? There are two ways of looking at responsibility on a team. One view would be to say that if there are 10 people on the team, then I’m responsible for 10% of the software development process. I don’t need to be concerned with the quality of the requirements because that’s the business analysts’ job. I don’t need to worry about testing my code because we have testers to do that. The other view is that even in a team environment, I am still 100% responsible for the software I’m creating. That means that I’m not just implementing the requirements, I’m trying to understand the requirements to make sure that they’re correct and that we’re building things in the best way possible that will meet the needs of the business. And that certainly means that I’m never ever going to send code to QA that I haven’t tested just because I think they’re going to test it for me. I need to be responsible for communicating with my team members the best that I can. I would much rather be clear about who is doing what rather than assuming. If I make an assumption, it’s probably going to be wrong – either I will assume someone is going to do something when they’re not and something will slip through the cracks, or I will assume someone is not going to do something when they are, and now we’ve duplicated effort. This is what I see happen often on software teams, especially when it comes to testing. Developers assume that QA is going to do the testing, so they give code to QA without completely knowing if it’s working. QA assumes that developers are going to do this and don’t know what was tested and what wasn’t, so they think they have to test 100% of the functionality of the feature. In reality, the developer probably wrote decent code that mostly works, and they probably did test it to some extent (whether manual or automated), so the tester is duplicating some of the effort, but if they don’t know what was already done, they don’t have a choice. This is where communication is key. If I as a developer am going to write automated tests to prove that my code works, then I want QA to be involved in the writing of the tests (even if that’s just reviewing what I’m doing). That way QA doesn’t have to duplicate effort because they can know that developers have already done some of the testing, and developers can start giving code to QA when they are confident that it works (with actual proof to back it up). QA and developers can work together to decide who is going to test what, what is going to be tested, and how it’s going to be tested. In this case, everyone is 100% responsible for the quality of the software. Instead of expecting others to cover for us, we work together with others to make sure everything is covered. This requires people to move past their traditional roles, trust each other, and work together. In the end, we won’t duplicate effort and we won’t let things slip through the cracks. We had a week-long debate awhile back about whether or not it’s OK to modify your production code in order to enable automated acceptance testing. I’m not talking about using dependency injection, interfaces, etc. to allow you to mock things in unit tests. 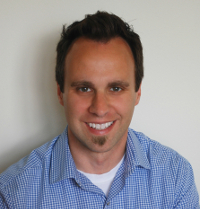 I’m talking about modifying application code solely to help your automated acceptance tests. To me, modifying production code to help us do automated testing is no big deal. First, if our goal is quality, I don’t think it matters how we get there. After all, we own the code base and tests so there aren’t any real restrictions on what we can do with the code or the tests as long as the end product is good. Second, developers and QA are on the same team, and we work together quite closely, so we should do what we can to help each other out. So if we can make a minor change to the application code to save us a lot of time developing or running automated tests, then to me it makes sense to do so. This goes back to my assertion that we need to stop thinking of QA like external auditors that have to take the application just as it is without talking to the developers and act as the independent quality police. We need to all work together to ensure quality, both developers and QA. Developers are just as responsible for quality as QA. If we place all of the responsibility for quality on QA, then developers will care less and less about quality, and you end up with shoddy code with lots of bugs (and usually no tests). I’d rather treat testing as a whole-team activity and structure the application to make testing as easy as possible. Recently I had the privilege of hearing Uncle Bob Martin talk at the Columbus Ruby Brigade. 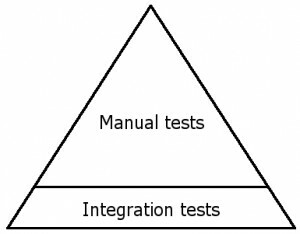 Among the many nuggets of wisdom that I learned that night, my favorite part was the Automated Testing Triangle. I don’t know if Uncle Bob made this up or if he got it from somewhere else, but it goes something like this. At the bottom of the triangle we have unit tests. These tests are testing code, individual methods in classes, really small pieces of functionality. We mock out dependencies in these tests so that we can test individual methods in isolation. These tests are written using testing frameworks like NUnit and use mocking frameworks like Rhino Mocks. Writing these kinds of tests will help us prove that our code is working and it will help us design our code. They will ensure that we only write enough code to make our tests pass. Unit tests are the foundation of a maintainable codebase. But there will be situations where unit tests don’t do enough for us because we will need to test multiple parts of the system working together. 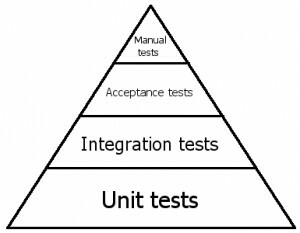 This means that we need to write integration tests — tests that test the integration between different parts of the system. The most common type of integration test is a test that interacts with the database. These tests tend to be slower and are more brittle, but they serve a purpose by testing things that we can’t test with unit tests. At this point, we’re are no longer just testing technical aspects of our system, we are testing that our system meets the functional specifications provided by the business. By now we should be able to prove that our individual pieces of code are working, that everything works together, and that it does what the business wants it to do — and all of it is automated. Now comes the manual testing. This is for all of the random stuff — checking to make sure that the page looks right, that fancy AJAX stuff works, that the app is fast enough. This is where you try to break the app, hack it, put weird values in, etc. I find that the testing triangle on most projects tends to look more like this triangle. There are some automated integration tests, but these tests don’t use mocking frameworks to isolate dependencies, so they are slow and brittle, which makes them less valuable. An enormous amount of manpower is spent on manual testing. Lots of projects are run this way, and many of them are successful. So what’s the big deal? Becuase what really matters is the total cost of ownership of an application over the entire lifetime of the application. 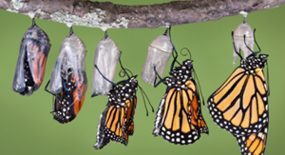 Most applications need to be changed quite often, so there is much value in doing things that will allow the application be changed easily and quickly. Many people get hung up on things like, “I don’t have time to write tests!” This is a short term view of things. Sometimes we have deadlines that cannot be moved, so I’m not denying this reality. But realize that you are making a short term decision that will have long term effects. If you’ve ever worked on a project that had loads of manual testing, then you can at least imagine how nice it would be to have automated tests that would test a majority of your application by clicking a button. You could deploy to production quite often because regression testing would take drastically less time. I’m still trying to figure out how to achieve this goal. I totally buy into Uncle Bob’s testing triangle, but it requires a big shift in the way we staff teams. For example, it would really help if QA people knew how to use automated testing tools (which may require basic coding skills). Or maybe we have developers writing more automated tests (beyond the unit tests that they usually write). Either way, the benefits of automated testing are tremendous and will save loads of time and money over the life of an application. I’ll be speaking on the SOLID software design principles at the Quick Solutions office (440 Polaris Pkwy., Suite 500, Westerville) on Wednesday, Sept. 16 from 5:30pm-to 7pm. In this talk, we’ll go through Uncle Bob’s “SOLID” software design principles, separation of concerns, a brief overview of inversion of control containers like StructureMap and Ninject, and more object-oriented goodness that will help you write better code. There’s free food too. If you’re coming, please RSVP to amorey at quicksolutions dot com so that we can have enough food. If you’re going to the Software Engineering 101 conference, this is basically the same talk that I’ll be giving there. So if you’re going to go to one, go to the Software Engineering conference since you’ll get lots of other good stuff there too. Don’t cheat on those small apps! In these cases, we often throw good software design principles out the window. We say that we don’t need to write unit tests, we don’t need dependency injection, we can put data access code in our code-behinds, and things like that. Since it’s a small app, we think we can get away with it. Just because your app didn’t take you long to write doesn’t mean that you get off easy. The consequences of your decisions just aren’t as severe, but that doesn’t mean that the pain is gone! How many times have you written some small utility to help with something and then your boss sees it and really likes it, and then he asks you to add more functionality to it. Eventually you’ve spent a couple months on the app. If you cheated at the beginning, that code is going to hard to change and it’s going to start becoming more of a pain. Maybe you’re writing a console app to help with your deployment process. Now this code better work, because if it doesn’t, your app might not deploy correctly. This is very important code! Doesn’t code this important warrant some extra attention (i.e. tests)? Look, I’m not saying that every little app has to be this big, blown-out, enterprise application. I’m just saying that you should be careful when you cheat, because you don’t want that to come back to haunt you. Many times you can take simple steps to make things easier to change. Take dependency injection, for example. It is really easy to set up an IoC container like StructureMap, it doesn’t overly complicate your code, and you don’t have to write tons of extra code to use it. But if you want to write tests for you code, dependency injection will make it a lot easier. You’re just putting code in better places. Again, there are times to use dependency injection and there are times where it’s superfluous. There are times when unit testing is essential and times when you can get away with it (personally I always like writing tests if I can, that way I know my code works). But you need to be careful. Software is software, and many of the same development principles that apply to big apps still apply to small apps. Why does our industry have such a low standard of quality? As I was writing my post on aspiring to be a Software Craftsman, I was thinking about why we have such a low standard of quality in our industry. Clearly there is a problem when there are so many software projects out there that are rewrites of previous projects, and businesses are hamstrung by software that is too difficult to change. I’m very much an optimist most of the time, honest! But I can’t help notice all kinds of things that don’t sit well with me. I had 5 classes in my 4 years of college that were relevant to software development. I graduated in 2002. They started us out on C++, which was a fair choice in 1998. I was not able to take a database course until my senior year. During my last semester they finally introduced an intro to Java course which I was able to take. No courses on .NET, no courses in PHP, no courses in software design, no courses on techniques that could’ve made me successful (like unit testing). The software industry is constantly changing, and many university programs are not keeping up. When you graduate you know just enough to be dangerous but not enough to really know what you’re doing. 4 years is a long time, you should be able to learn a lot during that time. If you want to learn about software development, there is always a user group you can go to, a conference you can attend, thousands of blogs you can read, podcasts to listen to, and on and on. There is a wealth of information out there, but the average developer is not taking advantage of it. Some of these people don’t care to learn. But I think that most people care about doing a good job. The problem is that their employer does not encourage it. If someone doesn’t want to spend their time outside of work reading blogs and attending conferences, that’s their choice. There is nothing wrong with leaving your work at work and spending time with your family or doing other things. But most employers don’t offer enough training during work hours, whether that is organizing lunch and learns, paying for their devs to go to CodeMash, bringing in guest speakers, etc. It costs a lot of money to build software. Shouldn’t employers be willing to spend a little more money to train their employers so that they can build better quality software? There are a lot of developers out there don’t know software design techniques and concepts like unit testing, what SOLID stands for, why you should use an IoC container, and why you should design with interfaces. I would guess that a majority of these developers would love to know this stuff, but they don’t know that they don’t know it. A year ago I had never used Rhino Mocks, and I didn’t know what SOLID stood for or what an IoC container was. I thought I was a good developer, and I was in charge of a fairly large project, but I didn’t know that I didn’t know these things. Now that I’ve learned all that stuff I am a much better developer than I was a year ago. But now I’m wondering what other important stuff I don’t know. My point is that I’m sure that it would really help developers if there was some way that they could go through some kind of training that would teach advanced software development topics like the ones that I mentioned. I see a lot of junior developers take Microsoft certification tests. It is unlikely that Microsoft certification tests will teach you any of the concepts that I mentioned. You will, on the other hand, memorize a lot of stuff that you can find on Google. I’m not saying that studying for and taking those tests won’t teach you anything, but they’re not going to teach you how to write quality software. Many IT managers and executives have very low expectations for their software. Having to rewrite software is widely accepted as normal these days. Wouldn’t it be so much better and cheaper to change your existing software when you need it to do something different? The problem is that so much of our software is too difficult to change due to bad design, lack of testing, and many other factors. Many businesses do very little to address the root problem — that their developers don’t have the adequate training or don’t have the ability to write good software that can last. Many IT managers believe that the best that they can do is this disposable software, so they decide that they might as well pay less money if they’re going to get low quality, so they turn to offshoring. Either way, they’re still getting the same low quality software and they’re wasting money rewriting their software every several years. Many business get sucked into short term thinking. I’m sure there are many ways that this can work, but here’s one way I can see this happening. Executives want to show results because they’re worried about their stock price. They demand results this year. IT Manager is under pressure to deliver something this year, possibly with a limited budget. Developers are under pressure to deliver something and have really tight deadlines. Developers throw something together and finish the project. IT Managers show it to executives who like what they see. Executives show it at a trade show and shareholders are happy. Two years later the software does not meet the needs of the business because the app is unmaintainable and they start budgeting money to bring in consultants to rewrite it. It would’ve made much more sense to invest more time and money into the project the first time so that it wouldn’t have to be rewritten two years later. But because the business needs to show progress to the shareholders they won’t do it this way. This is a tough situation, and I can understand why executives make some of these decisions, but it doesn’t seem to make sense to me. If you’re a developer and you write bad code, you probably aren’t going to lose your job unless there is a recession, you do a really really bad job, or just quit showing up for work. If a civil engineer builds a bridge that fails after 5 years, I guarantee you he won’t be working on bridges anymore, at least not at the same company. There is very little pressure in the software industry to write quality software. I don’t know what the solution to this problem is because it is a problem on so many fronts. But I do have control over what’s around me. I can aspire to become a software craftsman — someone who designs and writes quality software. I can hold myself accountable and make sure that I have high standards. And I can try and teach other people to do the same.